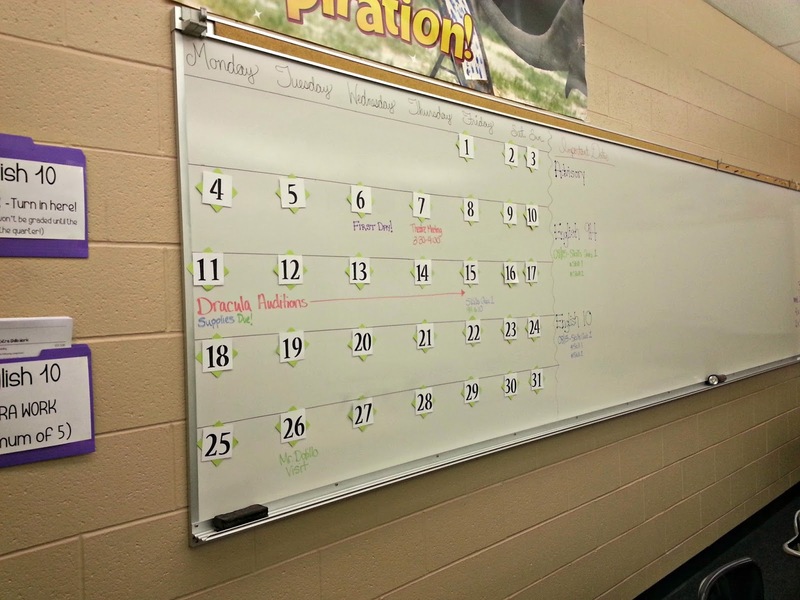 If you've been around this blog for a while or if you've checked out my 2013 and 2012 Classroom Tours, you may notice an immediate difference in my room. Ah, yes, change is in the air in Room A104. It may be because my personality profile (according to the work of Jung and Briggs Meyers) identifies me as an INFJ so I feel a constant need to reflect and perfect. It may also be a little bit of nesting instinct thanks to being 25 weeks pregnant. 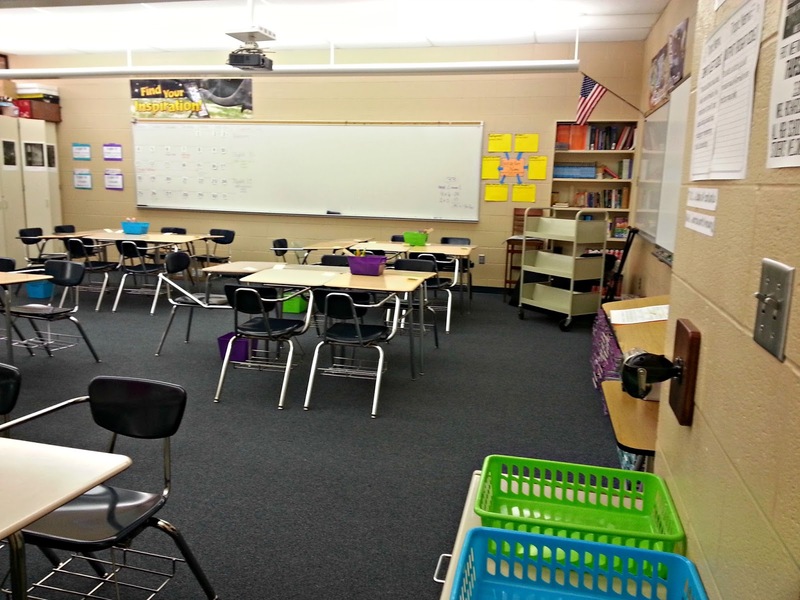 Either way, I've gone hog-wild and decided to make several changes to my room, my curriculum, my class organization, and my grading policies. Today is just a room tour (with a few sneak peeks at some of my changes I'm making) but I hope to elaborate on some of these changes over the next week or so before I return to school. 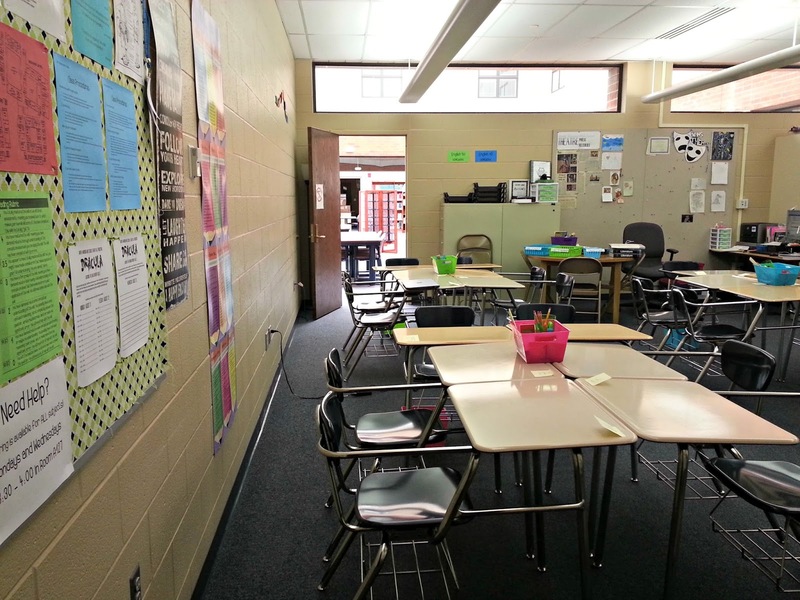 So, here are a few more full-room views, from my classroom door. Here's a closer look at my bulletin board by the door. 1. Consequences List - I keep a list posted of the positive and negative consequences that follow choices made in my classroom. After a conversation with a student at the end of last school year, I realized that I do a really good job following through with the negative consequences and a LOUSY job with the positive ones (a.k.a. "rewards") and that made me fell like a total asshat, so that lead to one of my changes I'm making this year. 2. 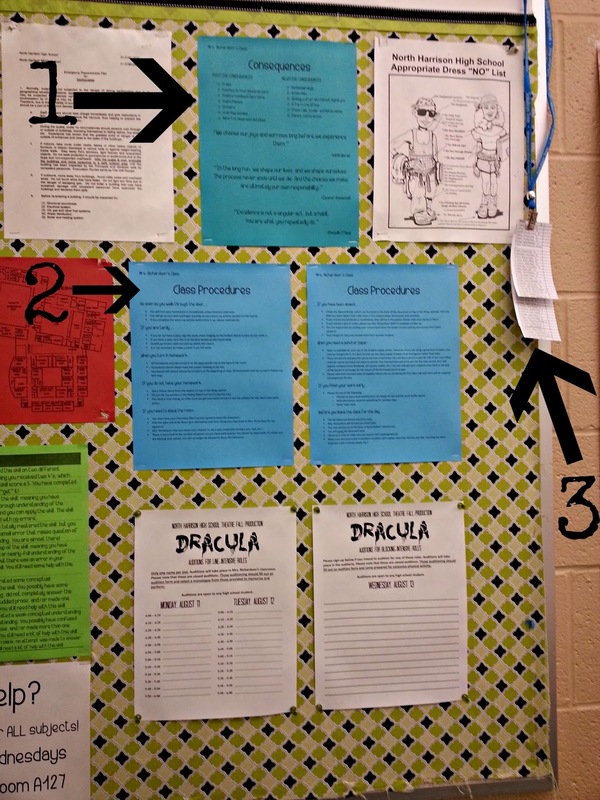 Classroom Procedures - I keep my classroom procedures posted all year too. A few people have asked about those, so I posted my own classroom procedures and consequences for your viewing pleasure. 3. Lanyard with Rosters - I found this idea somewhere over the summer and for the life of me I can't recall where, but it's a damn good idea. I printed off my class rosters, clipped them to the lanyard, and hung it up by my classroom door. Now, in the event of a fire drill, I can just grab the lanyard on the way out the door instead of hunting for my seating charts. 4. 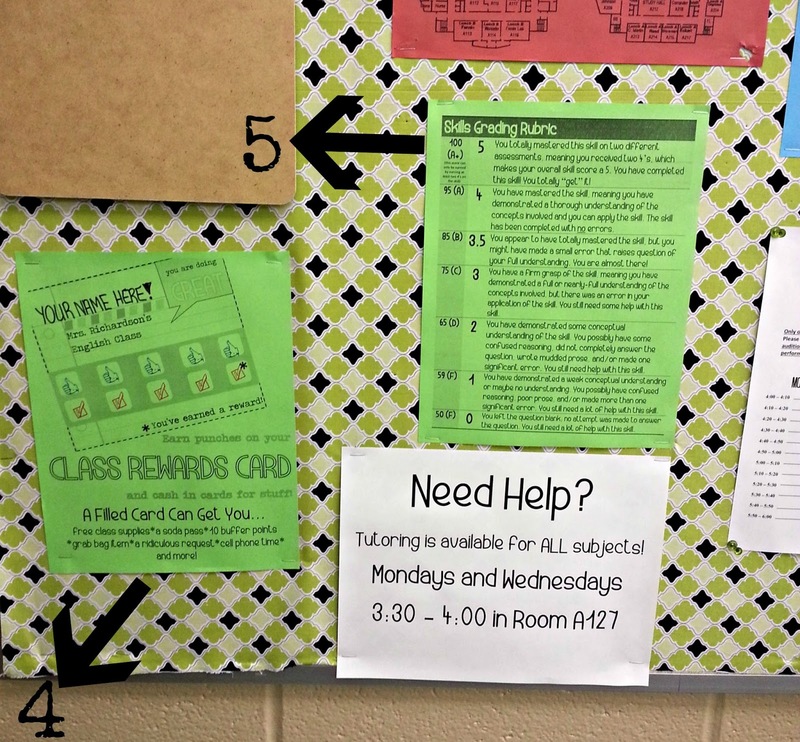 Class Rewards Card Poster - my solution to the positive consequences issue. Students will be issued rewards cards (just like you get at mall stores and gas stations). 10 punches = 1 filled card = incentives. Punches will not necessarily be easy to earn, though. I don't want them working only for incentives. I want the incentives to be a bonus. More details at a later date. 5. 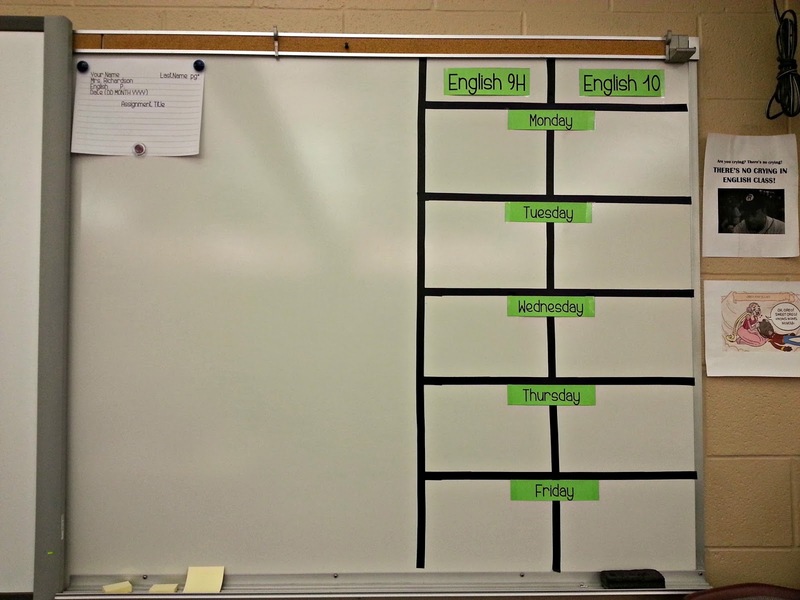 Skills Grading Rubric - part of my new grading plan that I was mulling over in this post. I took the idea and most of the wording from here at the Everybody Is a Genius blog. That chick is awesome and has inspired me greatly this summer. Check her out and give her some internet love! My board calendar I love so well! I had to ditch the ribbon because it didn't stick well and it goes really fugly as the year went ont. 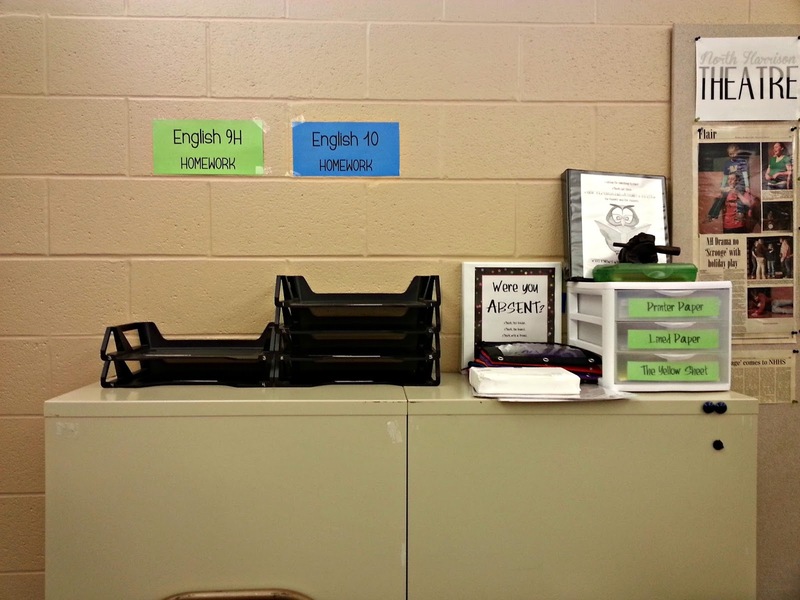 Oh, see those pencil pouches in front of the absent binder? I finally put together some storage for the mini-whiteboard fake-whiteboards-that-are-actually-white-cardstock-sheets-stuck-in-a-paper-condom supplies. 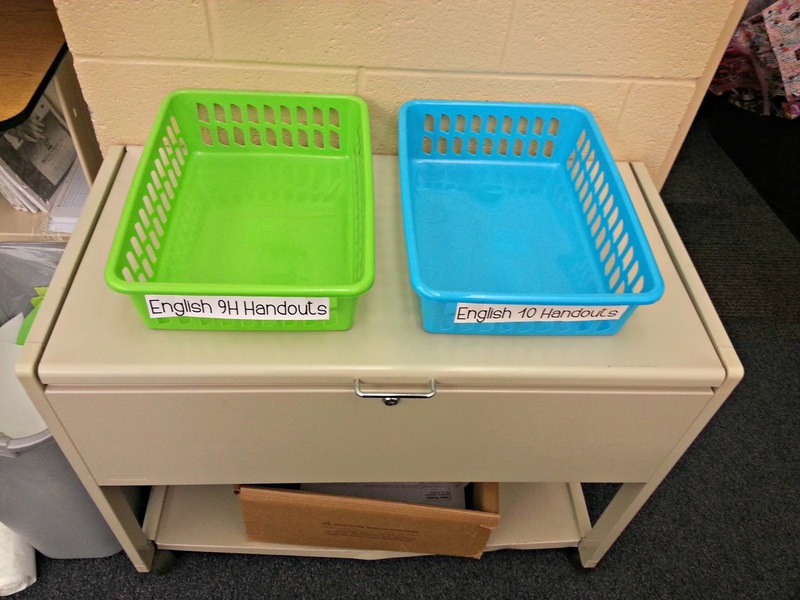 Some new bins for handouts, right by the door. New this year. 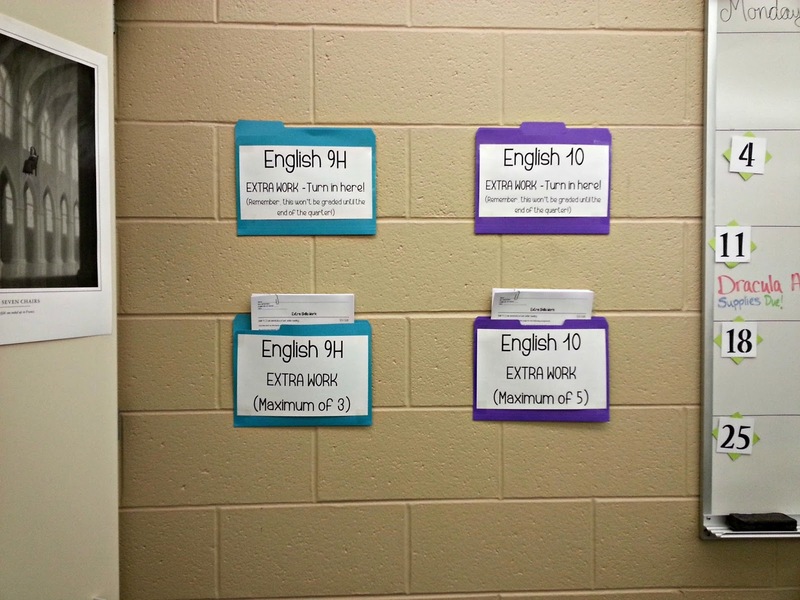 This wall is doing double-duty as an early finishers wall and a supporting assignments wall. This is the bin of supplies at each pod. 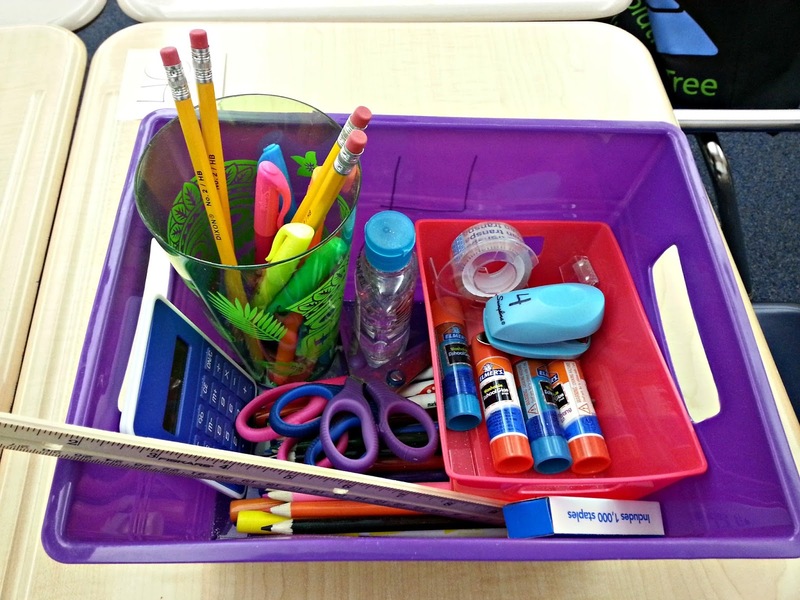 The supplies bins (and the pod seating) found their way into my classroom with the decision to try doing interactive notebooks this year (which I am fondly referring to as Smash Books). So, that's my room this year! Lots of changes. 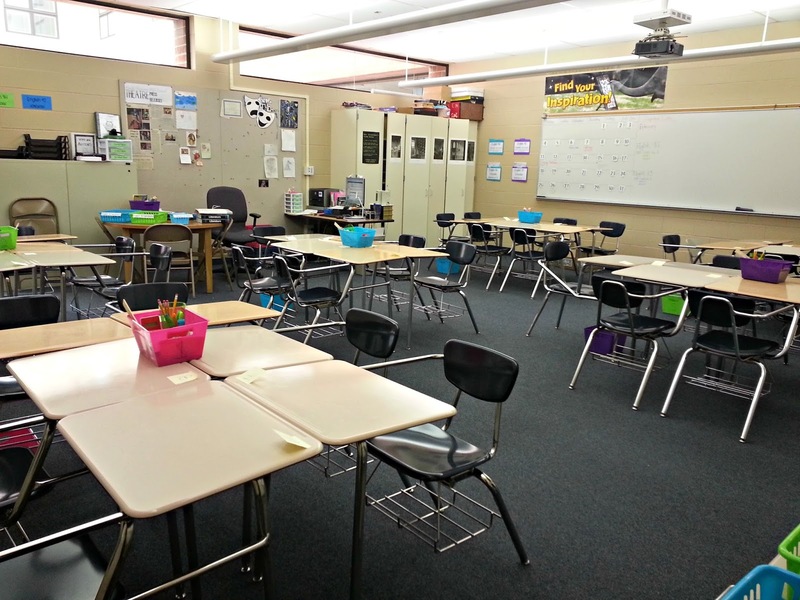 Are you making any changes to your room this year? Tell us about it in the comments below. 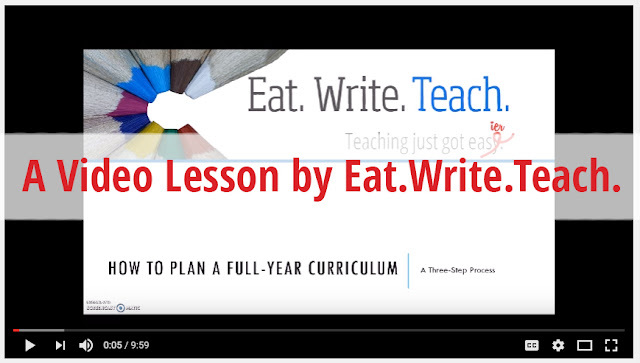 I love hearing other teachers' ideas!